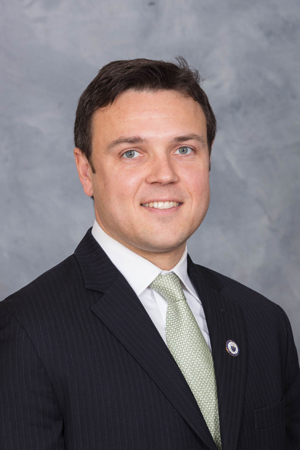 Kevin M. Madden was elected to Delaware County Council in November 2017 and sworn into office in January 2018. Kevin was born and raised in Media, Pennsylvania, and is a third-generation Delaware County resident. Kevin is a successful business builder, investor and executive, having spent his career founding, advising to and investing in business across a wide range of industries. Kevin currently serves as an Investing Partner for StartUp Health, the world's largest organization supporting and investing exclusively in early-stage health technology companies, with over 30,000 innovators within the StartUp Health Network. Previously, Kevin was Vice President of KPS Capital Partners, a family of investment funds with approximately $5.5 billion of assets under management. KPS makes controlling investments in companies across a range of manufacturing industries and is known for working constructively with management, labor, and other stakeholders to revitalize businesses experiencing a period of transition or significant challenges. During his nine years at KPS, Kevin was part of the core deal team on five investment platforms across the Automotive Parts, Metals Processing, Consumer, Healthcare and Textile Products industries. Collectively, these investments created thousands of jobs and built strong, sustainable businesses. Kevin started his career at Credit Suisse First Boston, working in the Latin American M&A and Global Industrials and Services Groups. Kevin attended Vanderbilt University, where he was a National Merit Scholar and a Paul Harrawood Scholarship recipient, and received his B.E. in Civil Engineering and Mathematics. Kevin also studied at the Universidad Católica in Santiago, Chile. Kevin lives in Haverford, PA, with his wife, Kate. He has volunteered for the Sierra Club and BARC Animal Shelter, and he ran his first marathon in 2016, raising over $8,000 in proceeds for the Hole in the Wall Gang Camp, a summer camp founded by Paul Newman that caters to children with severe illnesses.